← The Trip South Begins. Sharyn, Jeff, Murray and Leanne. What a wonderful time, 18 days, we spent in Glen Forrest with our friends/family Jeff and Sharyn and their son and daughters, who are triplets, Darcy, Emma and Hayley. When we arrived we were cranky, with each other, tired and wet from our time on the road when the weather had turned bad and we had the wettest pack up ever The Trip South Begins. Time off the road and with someone other than just ourselves was what was needed. 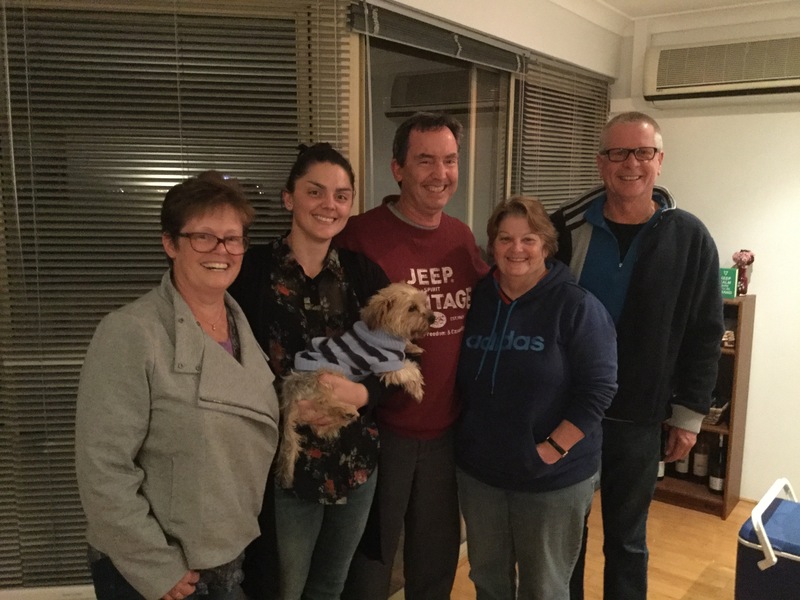 Jeff, Sharyn, Murray and I were very excited to see each other again and we were also excited to meet all three of their children, as we had already met Darcy and Hayley but not Emma before. Murray and Jeff were best mates from their airforce days together and it was hard to think they had spent anytime apart at all. Happy hour this first day was full of laughs and stories, which would only get better over the next couple of weeks with plenty more stories and memories to be shared into the future. Both Jeff and Sharyn managed to get time off while we were with them which made it easier to spend time together doing some touristing and enjoying each other’s company. The weather had well and truly turned cold with a hailstorm and plenty of rain on the first day we were there with the fire becoming my best friend every afternoon. We had taken the camper down to a neighbour’s place and set it up to dry out. Later it would come back to Jeff’s carport for some modifications to it such as a new jockey wheel and hitch, new bed struts as the old ones have had it, new trailer struts too, all this to make our lives easier on the road, while we spent time in a ‘real’ house and bed for our holiday here, which was nice for a change. Murray and Jeff spent many hours in the shed admiring Jeff’s collection of bikes, talking, laughing, working on our car and starting happy hours early everyday. Our car looks clean again after a good scrub and is sporting a new light bar after our issue on the Gibb with the old one falling off and the new battery charger is doing its job very well in the trailer. Within our first week we managed to make friends with the dogs, Aura, Emma’s pup and Desmo, Sharyn’s pup. Sister and brother, Alaskan Kleikai one year old and six months old, lovely dogs and so funny. Murray and I had to get some new clothes due to the fact he had no winter pjs and had only one flannie shirt with him and I had only bought one pair of trackies with me, not good enough in this cold burst, we were definitely feeling the temperature difference. Jeff and Murray got out on the bikes within the first few days and were like kids again. Murray rode a Ducati Multistrada, the red one and Jeff road the Ducati Darmah, the black one, Murray hadn’t ridden in quite a while but handled it with ease. I got to go to the “Georgie Girl, The Story of the Seekers” show with Sharyn as Emma was one of the dressers for Crown we had tickets. What a show, I loved it from beginning to end, I sang, I laughed and I cried. You couldn’t wipe the smile off my face all night. Each day Emma would tell us about her day and I was in awe of her, she is living her dream and loving it. Darcy is an aircraft maintenance engineer with Virgin West, where Jeff works also, and mostly enjoys his work. Hayley is a qualified environmental scientist but unable to gain employment in this area and so is following her passion of working with animals in studying to become a veterinary nurse. Each of them is doing well in life. 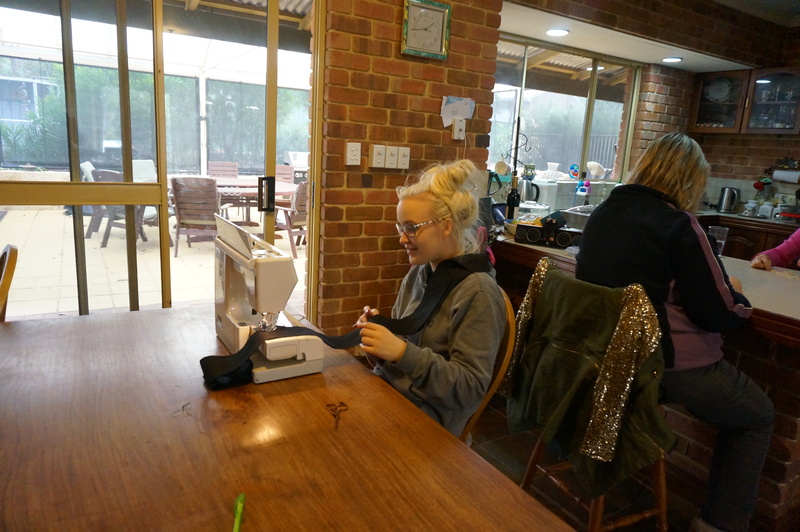 The busy worker, sewing for her oth job for a fashion designer’s show. 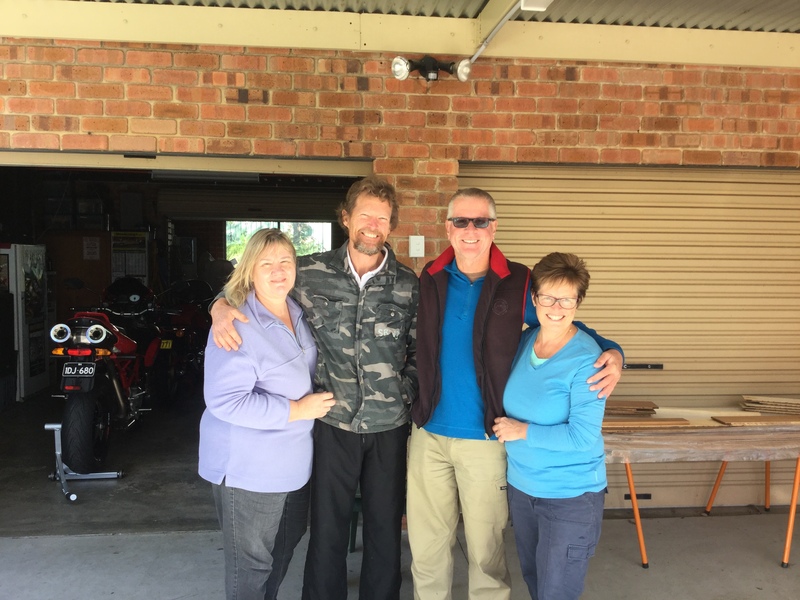 We also met the neighbours, Ruth and Jeff, from across the road during the first fe days, before they left on their trip around Australia, they had sold their house and will one day settle somewhere that meets their fancy, but for now the world is their oyster. This was a big night with Murray and Jeff beginning happy hour very early and being three sheets to the wind by the time the guests arrived. Both were very happy and talking a lot but Murray became the slurry one after several shots of sambucca. An entertaining evening. What was annoying is that the next day neither Murray or Jeff were unwell, maybe a slight dull head but that’s it. Not fair. Our first weekend was spent in York. On the way there we visited quaint little towns like Beverly where we ate lunch in a lovely park attached to the old railway and visited the local art gallery which was run by a very chatty front of house host and her hubby, who was one of the artists. In York the men went to the car and bike museum for some nostalgia time while Sharyn and I perused the bookshops, lolly shop and whatever else we could find in this beautiful old town. 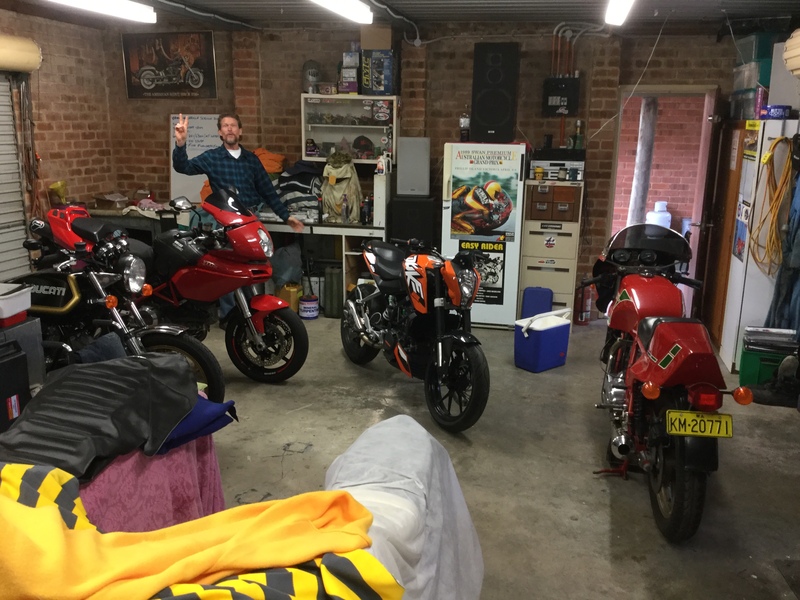 Another friend of Murray’s from airforce days, Peter Knox and his wife Maureen had a house in York so we dropped by for a cuppa and what was hiding in his shed but some motorbikes for the guys to drool over, listen to and enjoy. Peter and Maureen live in Perth city through the week but weekend in York working on their house which is heritage only meaning they have to maintain a certain frontage and can work on the interior as they wish. They have a fantastic property with a beautiful walk backing onto the Avon River not far from their back door. That evening, Saturday, we stayed at the Nod and Nosh and enjoyed Christmas in July at Settler’s House which is run by another mate, Brian Huddy, of Murray’s, apprentice intake, and Peter’s airforce days and who also knows Jeff from his current employment. His partner runs Settlers’s with him and her sister runs the accommodation of the motel. We had an absolutely fabulous evening with entertainment by Geoffoire Honkytonk on piano and as Santafella singing and also Psycho Santa, Narelle Belle as Santarella and Amy Housewine. These entertainers both made us laugh till we cried and had us all up singing, dancing and having a ball all night. The food was exceptional, three luscious courses of soup, Christmas dinner and pudding. What a fabulous night we spent with all these new and old friends, I even made it behind the bar before the night was over. We returned to Jeff and Sharyn’s on Sunday afternoon, rested up overnight and set out for King’s Park in Perth on the Monday morning, 18th, where we ran into the ‘Pokemon Go’ game that has taken hold of the world, people were everywhere on this day as this was the latest hub for the game. It didn’t take over our having fun though and as we hadn’t been to Perth for 24 years we made the most of our day. We also went to Elizabeth Quay which is the newest foreshore development in Perth. The next day Jeff, Murray and Emma all went for a bike ride to visit Jeff’s dad Dave in Safety Bay about an hour from the hills where we were. Sharyn and I went to the shops for dinner ingredients and spent time playing ‘Bananas’, a new word game better than Scrabble while having a few laughs. Wednesday was spent in the Swan Valley. A day for the girls. Wine tastings-only two wineries Talijancich Wines and Olive Farm Wines where the lady, Deb was so good Sharyn and I were nearly legless by the time we left, so we didn’t taste anymore after this one; chocolates which were so creamy, cheeses, noughat, nuts, and the biggest lunch at Penny Gardens before heading to Koffeeworks to select some coffee and teas to take home. We had the best day and talked all the way home while sightseeing on the way. Jeff and Murray headed for the Auctions the next day to see if they could get Emma a bike of her own as she was very keen for it, she had already achieved her learner’s permit to learn to ride, they returned home that afternoon grinning from ear to ear and the next morning bought the ‘newest member of the family home’, a KTM Duke 200 and Emma was ecstatic, to say the least. This garage is getting by busy. Friday we went to Perth Mint but Murray forgot the camera and I left the iPad in the car so no photos which is a shame as we saw an actual gold bar being made from melting to pouring to solid. This place was fascinating. That night we were invited to the Knox’s in Perth for happy hour and Pizza dinner. 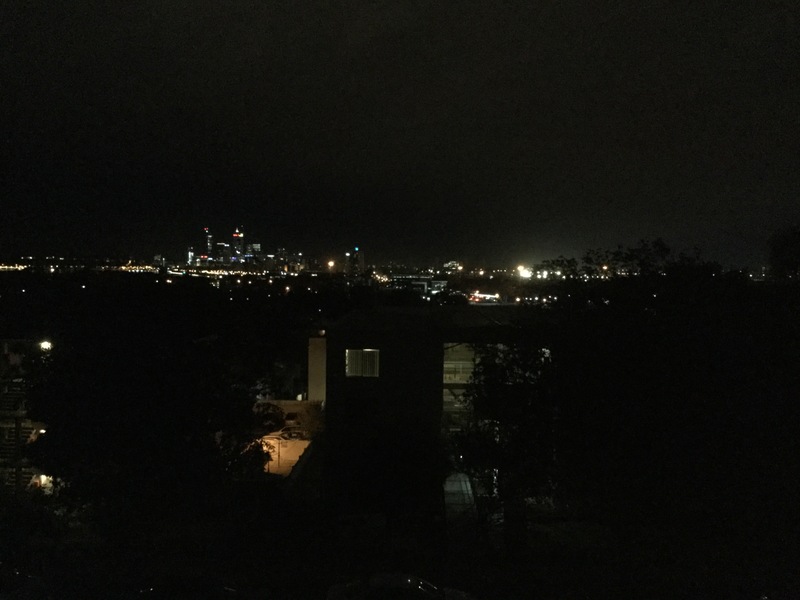 The view from their third floor apartment was amazing out over the night sky of Perth. Their daughter Kirsten came for dinner and we were so thrilled to meet her at last, another lovely young lady. Saturday we spent much of the day in Fremantle catching up with a family friend Rhonda Begg for lunch which was fish and chips at Kailis’ then we met up with her son and my friend since we were littlies, Daryl for coffee. We caught up on everything since we had last chatted and had a wonderful day together. The rain had once again settled in so after a quick look around the Fremantle markets we took off back to Jeff and Sharyn’s for a night on the lounge with a movie. 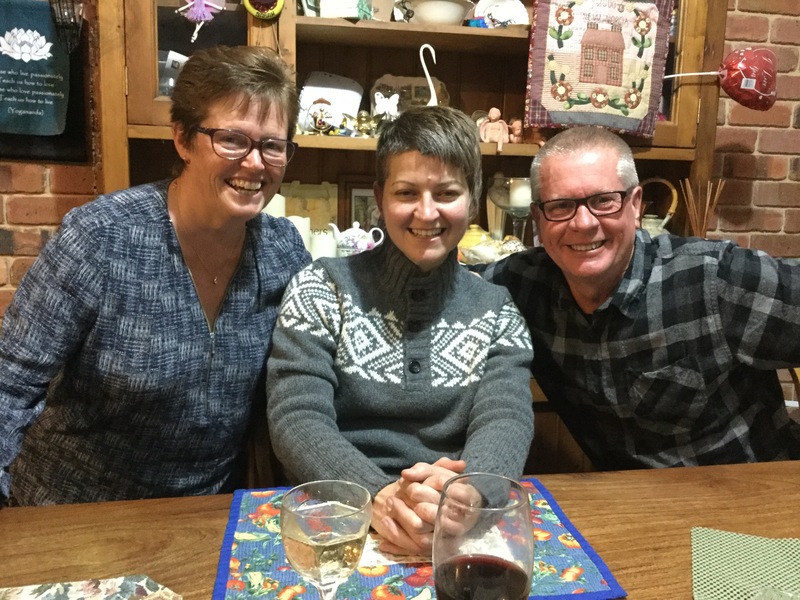 Another friend from Wollongong, Tammy who lives in Perth came to dinner in Glen Forrest on Sunday night and it was lovely to see her again, she is good friend with our friends back home, Bec and Kev. Our last day in Glen Forrest was spent washing, packing and Grocery shopping for the next part of our adventure down the coast. Dinner on this night was spent with the whole family, the first time all three children had been together since we had arrived, they are a credit to their mum and dad and each have their own unique personality. It was a privilege to meet them all. Lots of laughs this night, good food, drinks and singing. The bike came in for a family photo but doesn’t actually live in the house. What a wonderful family and fantastic friends these people are. Sad as it was to say goodbye to them all, we knew we would once again catch up in the not too distant future. Farewell for now to the Wards and thankyou so much for putting us up and putting up with us. We had a ball. Till next time. This entry was posted in Adventure, everything, Family, Friends, Life, Love and Laughter., New People, Western Australia. Bookmark the permalink. 1 Response to Time Spent With Lifelong Friends.